I recieved the first two books of a series by Eric Luper entitled Key Hunters. The series is written for children 7-10 but I believe older ages will appreciate it. At almost 50, I loved it! Getting lost in a good book has never been this dangerous! Cleo and Evan have a secret. A collection of books so dangerous they are locked up tight. A friend has vanished inside the pages of one of them. It's up to them to find the key that will set her free. A PRICELESS DIAMOND . . . STOLEN! When Cleo and Evan go undercover to help a rookie detective interview a mansion full of suspects, nothing is as it seems. 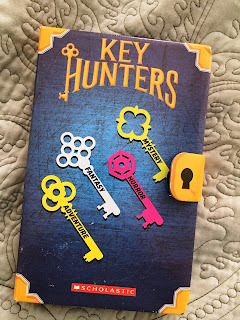 They must catch the crook - and find the right key - or they could be trapped inside this mystery forever . . .
Cleo and Evan love the library, they especially loved their Liberian Ms. Hillard. But now they have mean old Ms. Crowley who is either telling them to "shhhhh", appears like she is up to something or is always disappearing. One day they decide to follow her and find a secret panel that leads them to an enormous basement under the library. It full of books and shelves AND a note from their first librarian Ms. Hillard. This is where it gets good!!!! The children suddenly find themselves inside a book solving mysteries and encountering mean old Ms. Crowley among all the other characters inside the book. If the mystery is not solved the children will be trapped in the book. The story is well written, suspenseful, and full of twists and turns. 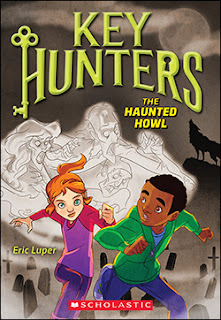 Kids will definitely want to see what happens, what happened to Ms. Hillard and what stories the kids get into next. This is a fantastic fantasy read for book and mystery lovers of all ages! A SPY MUST BE READY FOR ANYTHING! 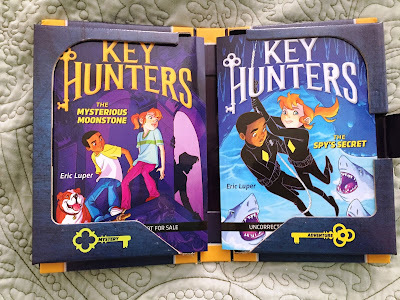 Agents Cleo and Evan have been given an impossible mission: become super-spies and foil the plans of an evil mastermind. But it won't be easy to break into the Viper's secret underwater lair, complete a daring rescue, find the right key, and get out alive!! Sounds like a great choice for my kid! I love how the two books are packaged together. I love these books! I think you are right. Even big kids would love books about spies!